No, that bowl of garlic was not my breakfast. I DID enjoy that cup of green tea with raw honey. I love sunny mornings in my kitchen. I keep my garlic in a cute little vintage mug on my counter :) too cute! Mmmm! Raw honey has so much more depth than the squeezy-bear bottle kind! SO many good-for-you enzymes, too! p.s. I want to steal your canisters. Ha! It's a little ironic that we're doing the gluten-free, refined sugar-free diet and I have those sitting on my counter. It's where we hide our coffee and tea! oh my gosh I LOVE that cup! Yellow and flowers are two of my very favorite things and my kitchen is full of both too! I miss sunny mornings in my kitchen..a whole wall of them looking out into the back yard, sigh. your kitchen looks just adorable, so cute and cheery. cute sunny kitchen:) I just bought myfirst jar of raw honey...and im in LOVE!! Such a beautiful cheery photo! Makes me smile! I love my kitchen in the morning too! So warm, inviting, and just beckons to make something warm to drink and cozy up for a bit. Sounds like a perfect morning in an adorable kitchen. 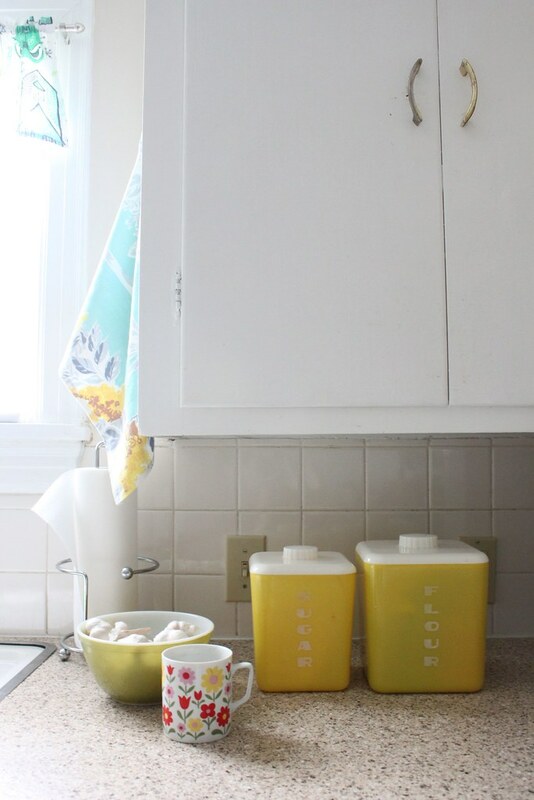 Your kitchen is so sunny, happy & cheery. If my kitchen was like that, then maybe I wouldn't let my sweetheart take it over like he has (he's the cook in the house). Don't worry about the garlic, we have a bowl full in our kitchen at all times. Drives my beagle crazy (he loves the smell). Yup I also always keep a bowl of garlic on the counter (also not to eat for breakfast!). I also have a big bowl of onions and usually a glass of fresh herbs... I find that it inspires me to cook when I'm feeling lazy! Love the little peak of your kitchen. Have a lovely weekend! Enjoy some tea and smell the flowers! I love your canisters! I have the Bread Box that matches that set! This shot is like fresh air. Just what I needed this morning (you know, other than actual fresh air)! i have a bowl of garlic too, always:) sometimes i cringe when company comes over cuz i think maybe it smells REALLY like garlic. love your pics! I have a bowlful fo garlic, too - we're not weird, are we?